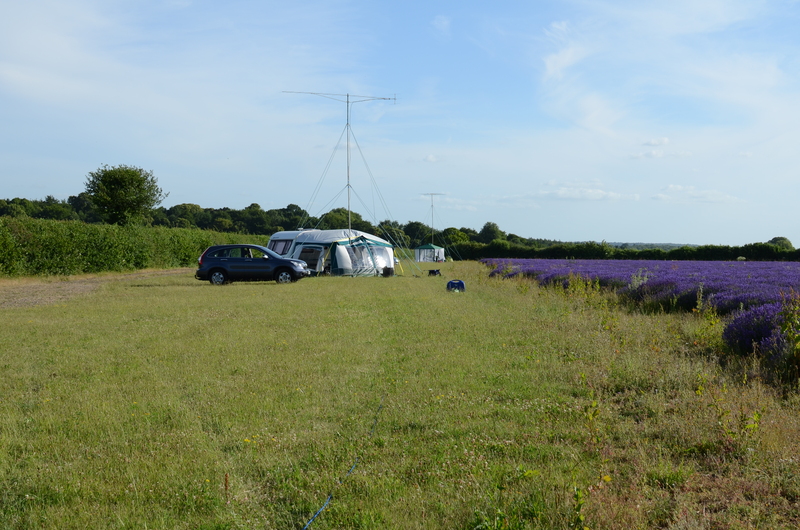 The VHF National Field Day is an RSGB-run amateur radio competition. 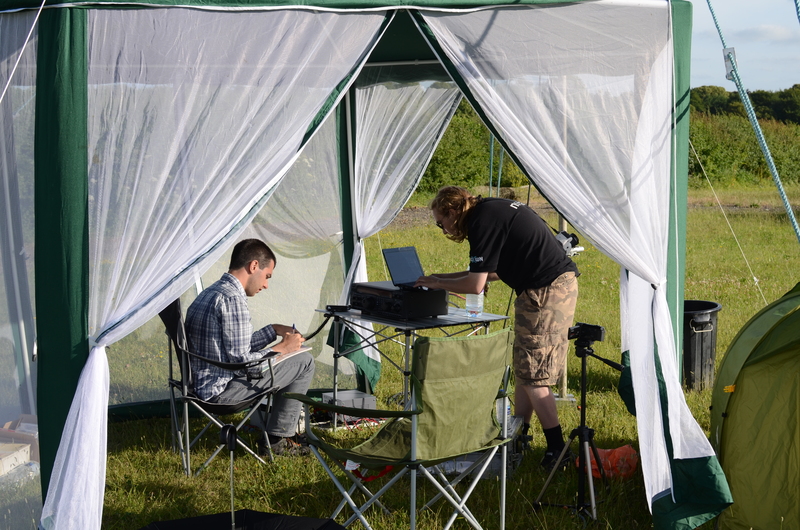 In this competition the contestants are required to operate a portable station (without the use of any permanent structures, or grid power) on the VHF bands. Points are awarded per km per contact logged on each band during the 24 hour operation window. The full rules for the competition can be found at http://www.rsgbcc.org/vhf/rules/15rules/VHFNFD.shtml. As in the last few years, we entered this competition in cooperation with the Basingstoke Amateur Radio Club (BARC). We operated under the Restricted category for all but 70cm for which we entered the Low Power category. The Club callsigns were split between the different bands; we operated under our callsign G3KMI/P for 6m and 70cm, and BARC’s callsign G3TCR/P on 2m and 4m. 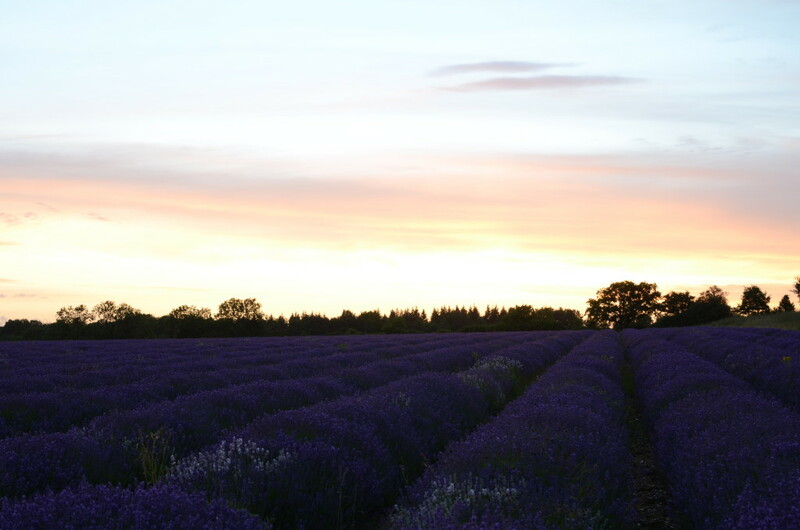 This year we were unable to use our previous site at Woodgarston Farm in IO91KH, so we operated from a new site located just over the hill in IO91JG next to a vividly coloured lavender field, by the generous permission of the landowner. Setup was performed Friday afternoon and Saturday morning, and tear down was finished quickly on Sunday afternoon. Thanks go to BARC for handling the setup on the Friday, as well as much of it on Saturday. The 6m and 70cm stations were manned largely by SUWS members with BARC taking on the operation of 2m during the day. G3KMI took on the 2m night shift. Following an unexpected fuse failure in the 2m rig on Saturday evening, we swapped it out for the rig intended for 4m that could also do 2m. This was fixed overnight and we swapped back to that rig on Sunday morning. Due to initial uncertainty over the 2m rig failure, combined with a shortage of manpower at the time, we elected not to run the 4m station on Sunday. Despite the forecasted threat of rain, the weather was rather pleasant throughout the weekend, with a particularly spectacular sunset on Saturday evening.